The awesome Procreate iPad illustration application has today received a new update from its developers Savage Interactive Pty Ltd which brings with it a wealth of new features, tweaks and performance enhancements. The latest Procreate iPad illustration app now includes support for Apple’s new iOS 7 operating system and its 64-bit A7 processor and has been optimised for the new iPad Air and iPad mini with Retina Display. Other new features within the Procreate iPad app include powerful new GPU accelerated filters and adjustments including : Gaussian Blur, Sharpen, Noise, Hue, saturation & brightness, Color Balance (Highlights, Midtones, Shadows), Curves (Gamma, Red, Green, Blue). Together with a new streamlined gallery, redesigned icon, orientation memory, includes latest SDKs for all styluses, bug fixes and many stability improvements and the obligatory improved performance. 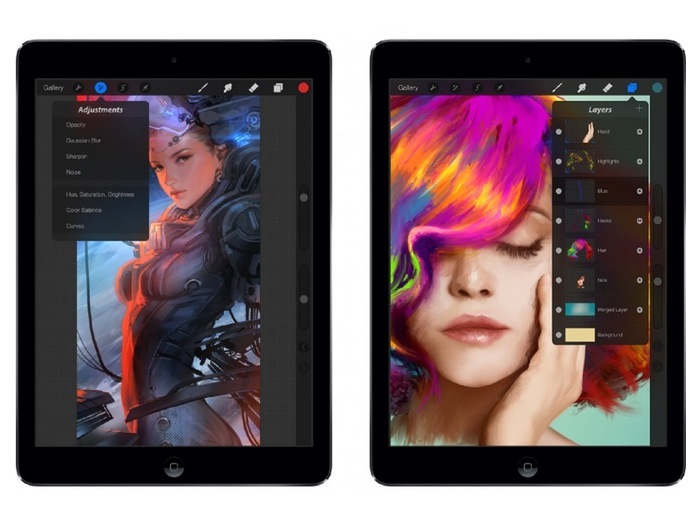 “Procreate is the most powerful and intuitive digital illustration App available for iPad. It’s packed with features artists love, from true-to-life sets of pencils, inks and brushes, through to advanced layer compositing, 64-bit performance and unique digital tools. And it isn’t just iPad friendly – it’s an iPad exclusive. Creatives are embracing Procreate for it’s deadly combination of intuitive design, raw processing power and innate understanding of the artistic process allowing them to work with a world of familiar techniques alongside the limitless potential of the digital medium.